Brain haemorrhage. Coloured 3D computed tomography (CT) scans of the brain and skull of a 75 year old patient with a intracerebral haemorrhage (bleeding). 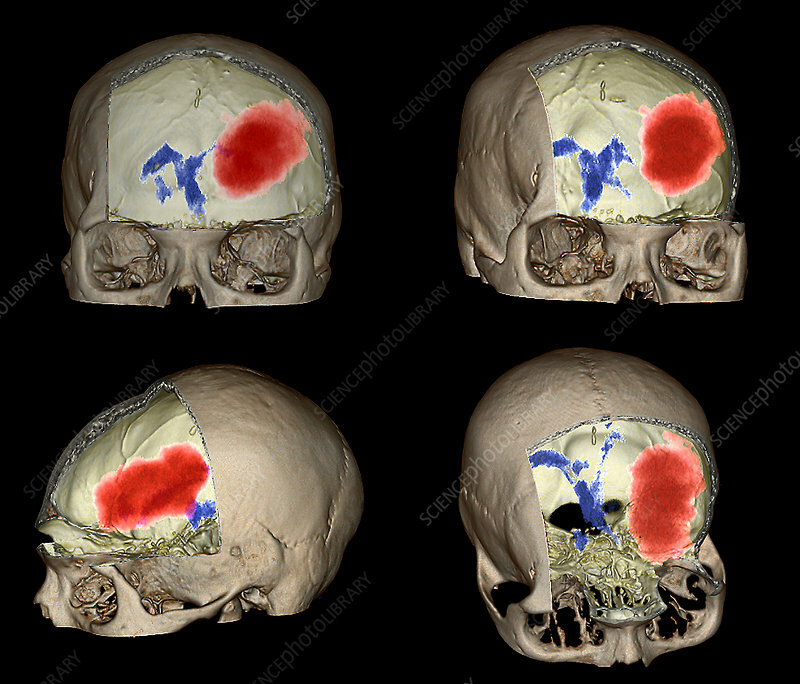 Blood (red) is leaking into the ventricles of the brain, causing a haematoma (solid mass). Intracerebral haemorrhages are most often caused by hypertension (high blood pressure), but may also be caused by injury, drug abuse or an abnormality of the blood vessels. Symptoms include headache, nausea, vomiting, and deficiencies in balance, coordination and focusing the eyes. This is a large haemorrhage, estimated to measure 60 cubic centimetres. Treatment is with surgery to remove the clot, but prognosis is poor.